Manufacturer & Exporter of Silver Grey PVC Coated Aluminum and GI Sheets. Our product range also comprises of PVC Laminated GI Sheets, PVC Laminated Aluminium Sheets and PVC Coated Aluminum and GI Sheets. Our organization is widely popular in the industry in offering a wide range of Silver Grey PVC Coated Aluminum and GI Sheets to our clients. In the corrugation process sheet metal is pulled off huge rolls and through rolling dies that form the corrugation. Moreover, after the sheet metal passes through the rollers it is automatically sheared off at a desired length. 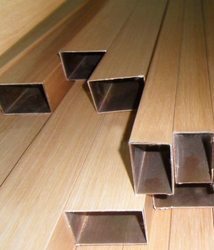 The standard shape of corrugated material is the round wavy style, but can be easily modified to a variety of shapes and sizes by simply changing the dies. Our products are delivered to our clients after a deep inspection. Looking for Silver Grey PVC Coated Aluminum and GI Sheets ?